By PINOTPALOOZA February 7, 2018 March 1st, 2018 AUST, MORNINGTON PENINSULA, WHERE DO YOU PINOT? The Doctor’s bread. It’s all Dan and Peter can talk about on the drive down the M3. We’re heading to Moorooduc Estate – the first stop on our two-day tour of the Mornington Peninsula – and, in anticipation, none of us have eaten breakfast. Dr Richard McIntyre and wife Jill established Moorooduc Estate in 1982, and produced their first vintage in 1986. 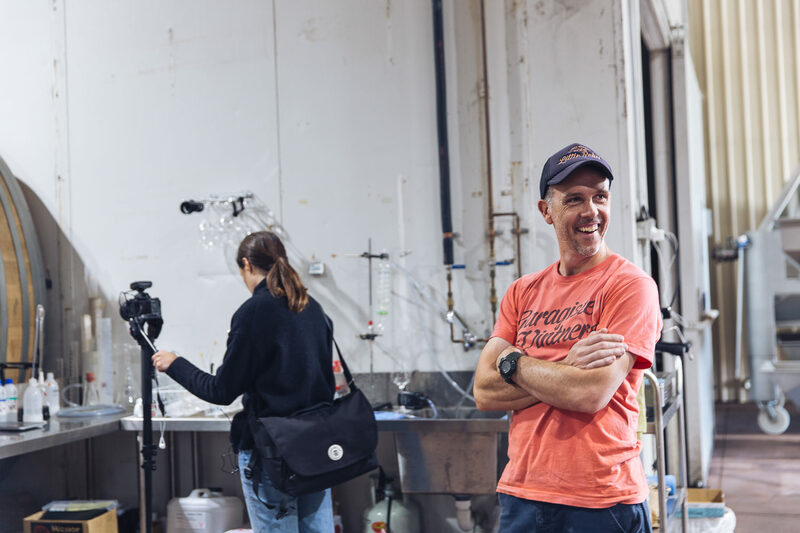 Winemaking is a science, and all winemakers possess an aptitude for it, but Richard’s medical brain – he was a surgeon before he switched to wine – places him a step above. Fascinated with wild yeasts and wild ferments, Richard’s obsessiveness meant that Moorooduc Estate became one of the first Mornington Peninsula wineries (nay, one of the first Australian wineries) to make “natural” wines. His interest in yeast also led him into the world of sourdough bread. “I reckon it’s the best bread I’ve ever had,” says Dan, putting the Defender into park. “I hope they have some.” We’re in luck – just. Weekends are reserved for bread baking (you can buy some from their cellar door on Saturdays and Sundays), so the loaves leftover on this particular Tuesday morning are best toasted. Between slices, and under the begging gazes of the estate’s poodles and the keening of Reggie, the resident peacock, we look at the wines. We’d love to linger, but we’re trying to cram as much of the Peninsula in as possible. So it’s goodbye to Richard and daughter Kate (an MW who reps for the family at Pinot Palooza), and back on the road, en route to Yabby Lake Vineyard. Yabby Lake is an impressive spot. A hundred or so metres of carpark and gum trees stretch between the winery and the Cellar Door and restaurant. On the other side of the restaurant, grounds dotted with Australian sculptures spill out onto the vineyards. 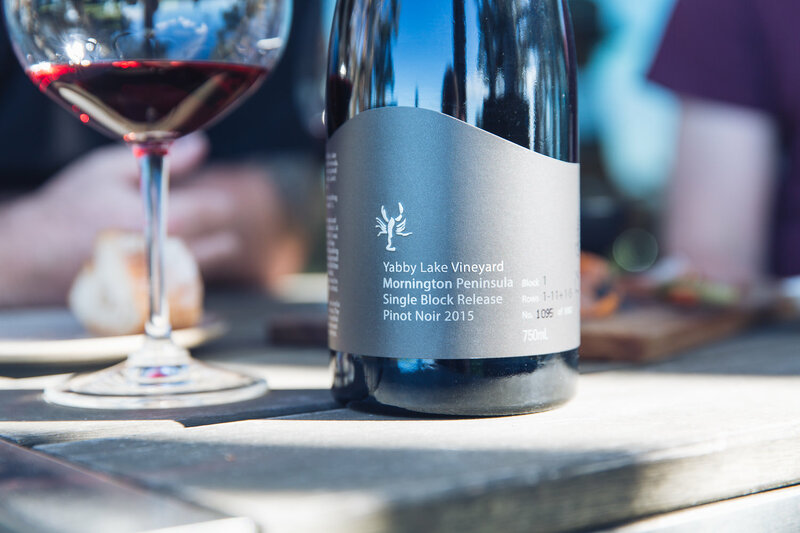 Some of the best Pinot Noir in Australia is made at Yabby Lake, and even if the vineyard was horrible, it’d still be worth a visit just for that. As it is, the wine is only improved by the beautiful setting, making it a must-hit if you find yourself down this way. Next, it’s off to see winemaker Geraldine McFaul at Willow Creek. 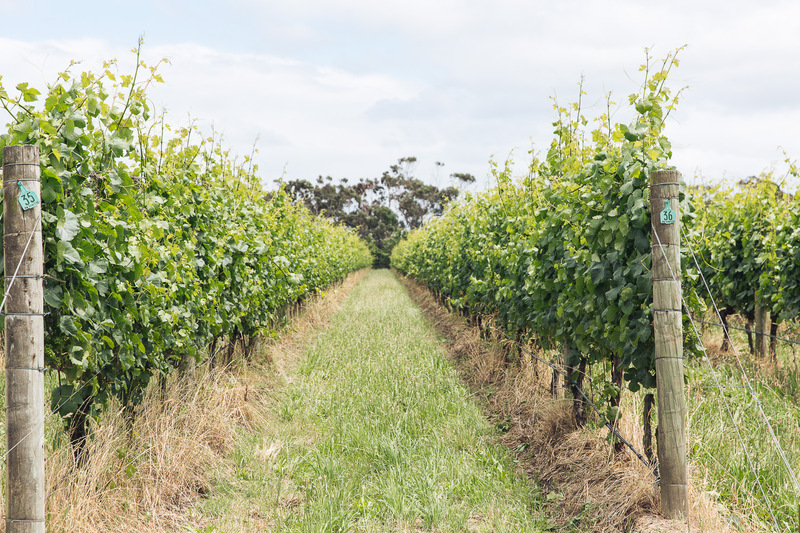 The 11-hectares that make up this vineyard were planted in 1989, but the whole site was recently thrust back into the spotlight with the opening of restaurant Rare Hare (Willow Creek’s cellar door), and boutique hotel Jackalope. At (a minimum of) $650 a night, Jackalope isn’t necessarily a cheap getaway. If you can afford it – or have occasion to splurge – then please, do so. But if you can’t, or don’t, you’ll find lunch and a wine tasting at Rare Hare to still be worth the drive. We do. As hard as it is to tear ourselves away from the plates of mortadella and cured kingfish, we must. We’re due at Crittenden Estate. Like Moorooduc, Crittenden Estate was first planted in 1982. And like Richard, Garry Crittenden was a pioneer of Mornington Peninsula Pinot Noir. 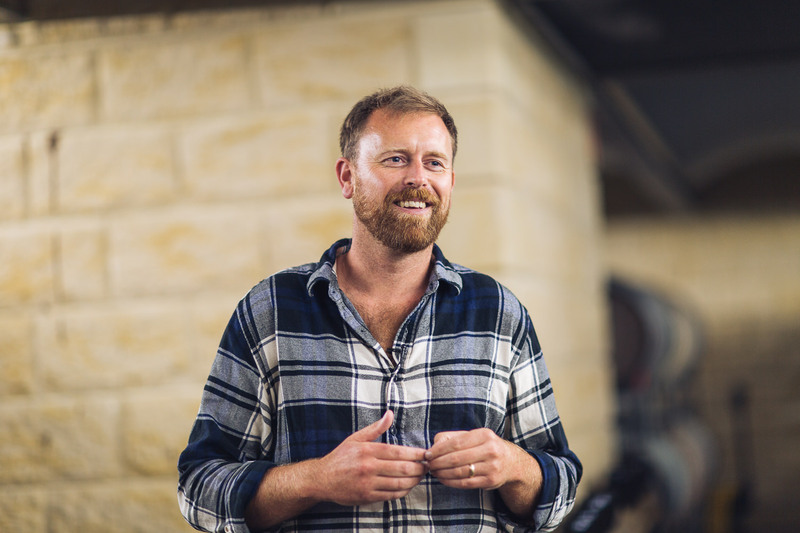 These days Garry’s son, Rollo, manages the winemaking, and after a quick tour of the onsite accommodation, the boutique Lakeside Villas, led by Rollo’s wife Linda, we meet him for a chat and a tasting. 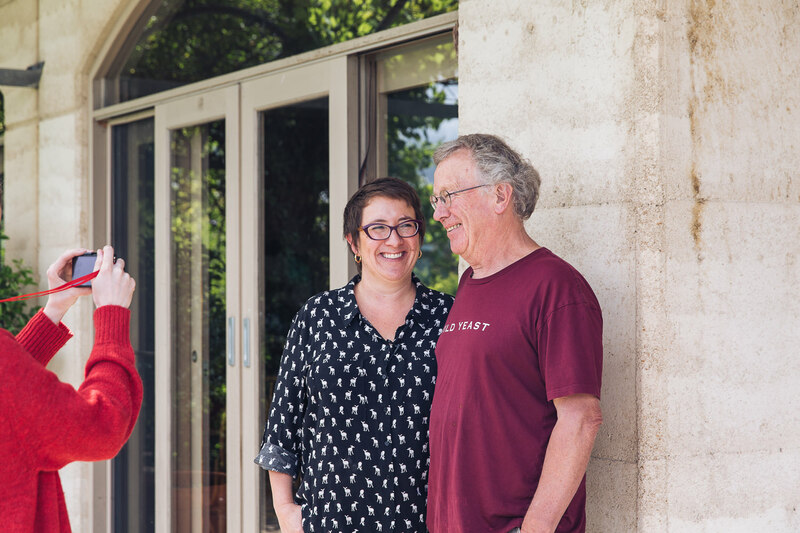 The winery at Crittenden Estate was converted from the Crittenden family home – the Wine Centre, or cellar door, was once Rollo’s childhood bedroom – and it’s definitely retained a relaxed, comfortable vibe. It certainly makes it easy to get stuck into the 26 wines on tasting; in particular, the 2013 Cri de Coeur Savagnin. It’s made in the Jura style and not only is it absolutely outstanding, it’s proof of just how innovative and daring the Crittenden family are. Our final stop for today is Trofeo Estate. The restaurant here – Whispering Vines – is always packed, especially on weekends, but although the winery itself is well known what’s less known is how the wines here are actually made. When the Greeks and Romans used to make wine they’d age it in egg-shaped clay vessels called amphora. Recently, some winemakers have been drawing on this ancient technique and aging wines in amphora of their own. One of these is Trofeo Estate. But where the others may experiment with one wine, Trofeo is making all their wine in amphora. 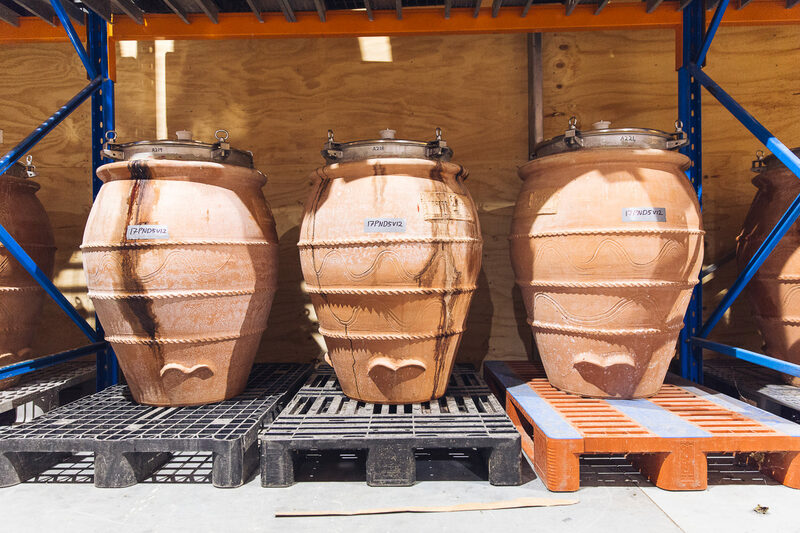 Their “barrel” room has not one barrel in it – rather rows and rows of these big clay pots. It’s much more unpredictable aging wine this way, but it can be incredibly effective, and definitely makes for some interesting and unusual wines. Want to see exactly where we went and more? Check out the awesome map below from our mates at Alpaca.Travel! Peter won’t stop talking about the Cape Schanck lighthouse. He’s from Brisbane (we try not to hold it against him), so we humour him with a quick stop at what he swears is the southernmost point of mainland Australia (it’s not. It is, however, the southernmost point of the Mornington Peninsula) before driving back to Red Hill for breakfast at the General Store. 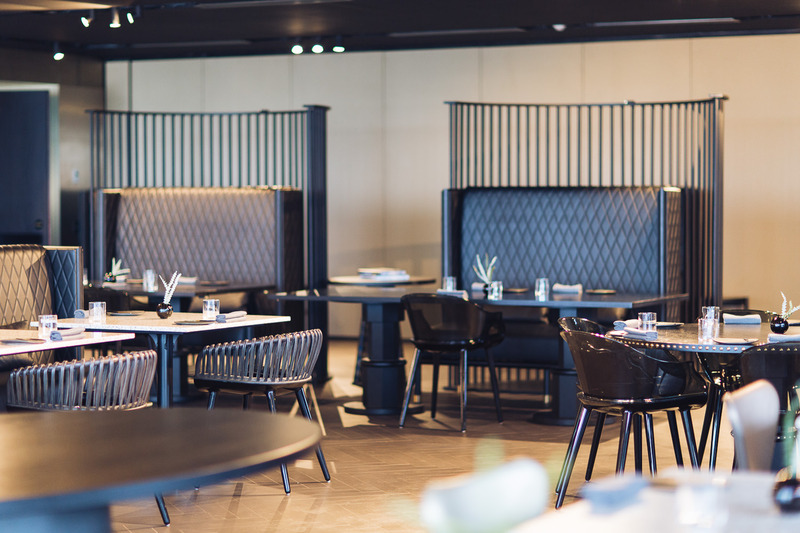 We keep it light, because we’ve got lunch planned at Paringa Estate’s one-hat restaurant. But first, a stop at Garagiste. Unfortunately, there’s no cellar door here so it’s not a place where anyone can just pop by for a tasting – you do need to make an appointment. We head into the big green glorified garage which houses all the tanks, barrels, presses and other equipment needed to make wine, where Barney has already pulled the cork out of eight different bottles of wine. We start with the Turkish delight and rose petal flavours in the Côtier Gewürtztraminer and Pinot Gris, and move steadily through the Chardonnay to the Pinots. And then the gin. Barney and Cam Marshall decided to try their hands at making their own gin in mid-2017, and with the finished product only making it onto shelves in November, we’re some of the first to try it. It’s distilled with 20 different botanicals, some – such as kelp, samphire, salt bush and wild fennel ¬- foraged from along the Peninsula. It’s also unfined and unfiltered to give it texture. Paired with a wheel of dehydrated orange and Fever Tree Mediterranean tonic water, it’s honestly one of the best we’ve ever had. We’d love to stay and really get stuck in, but we’ve got four other wineries to hit today (also, it’s like 10am), so it’s off to see Mike Aylward at Ocean Eight. 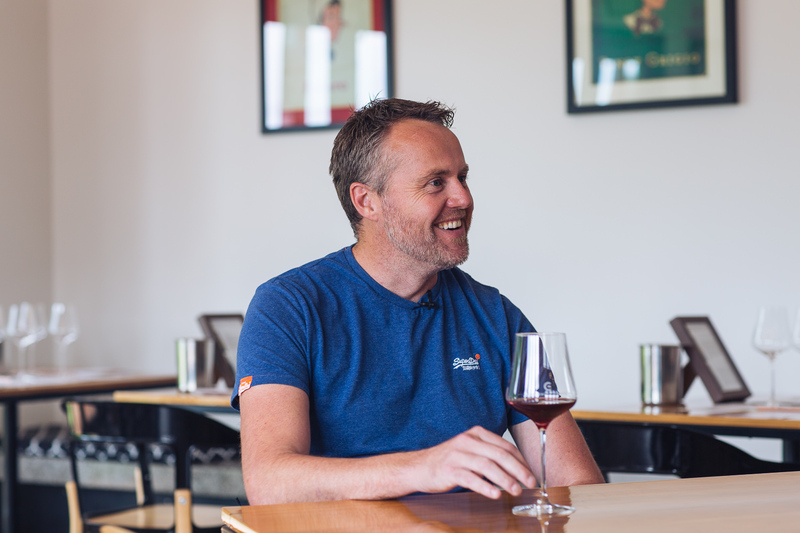 The Cellar Door at Ocean Eight is open 11am to 3pm, Thursday to Sunday, and is definitely worth a visit if you’re in the area – Mike is making some really delicious, exciting wines. He might even treat you to a barrel tasting if you ask nicely enough. Just follow the trap door down the stairs beneath the tasting room, past the crown-capped, aging sparkling, to the rows and rows of Pinot Noir and Chardonnay. The experience here is no-frills – there’s no food offering, it’s just about the wine, which you are welcome to enjoy a glass of in the gardens if you choose. We suggest you do. Next up, the beautiful Paringa Estate. From the top of the hill, where we park the Defender, we can see rolling vineyards, brightly-coloured roses, gaggles of angry geese and the cellar door, restaurant and winery. 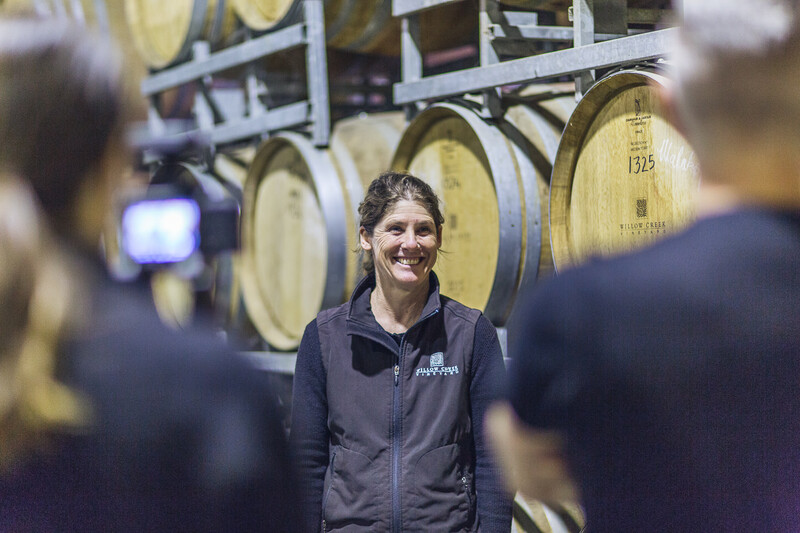 We’re met by winemaker Lindsay McCall and marketing manager Nick Justice, and led down the sloping concrete path to the winery for a look at the current releases. 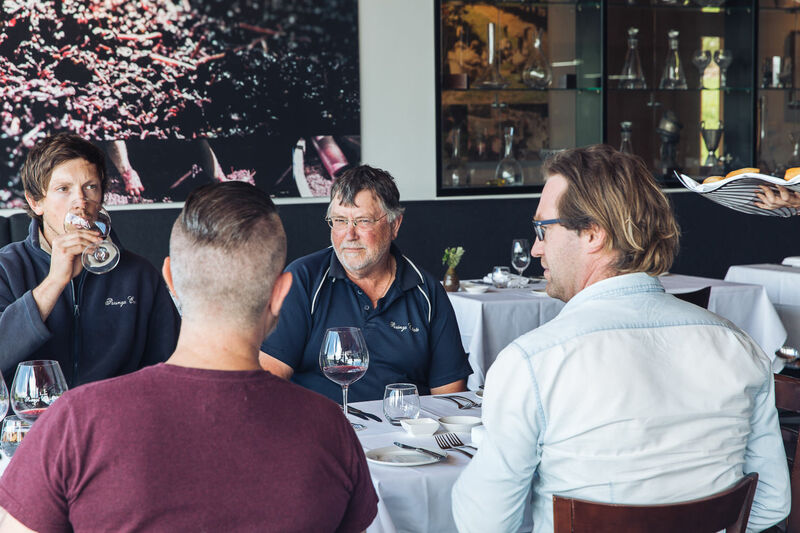 Lindsay’s son Jamie joins us after a bit – he’s slowly taking over as winemaker at Paringa Estate – and then we’re all treated to an outstanding lunch in the restaurant. Pork, duck and Pinot. Of course. Polperro is the next stop on the tour, and it probably needs no introduction. 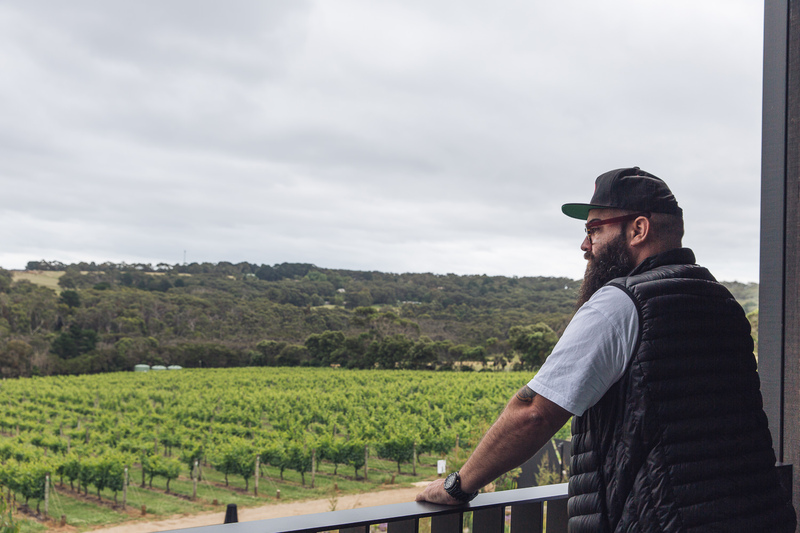 If you’ve ever been to the Mornington Peninsula on a winery tour, or asked a friend to suggest a winery for lunch, Polperro is likely what came up. It’s not hard to see why. The grounds are absolutely stunning, and the offering is always exactly what you’re in the mood for. A casual but top quality restaurant, excellent wines, seats with blankets in the winter, a fire pit and more. There’s even onsite accommodation if you wanted to stay for a night or two. We have, technically, finished our tour of the Mornington Peninsula. We’ve visited so many wonderful wineries, and we know there are many more we missed out on this time. 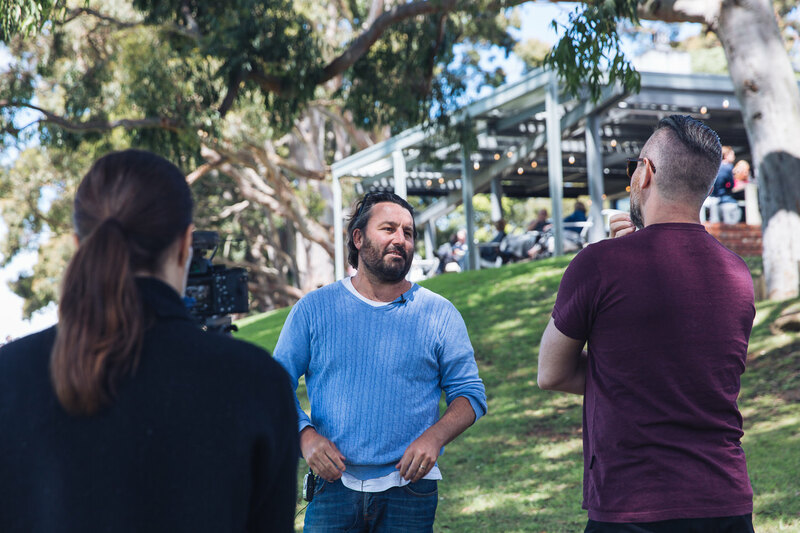 But wanting to make the most of this opportunity, we head home via the impressive Port Phillip Estate where Dan’s arranged to host one of his Wine Day Out talks with the MP Vignerons. Whether you head left towards the restaurant, or right towards the more casual cellar door, you’re afforded incredible views of the estate from both. 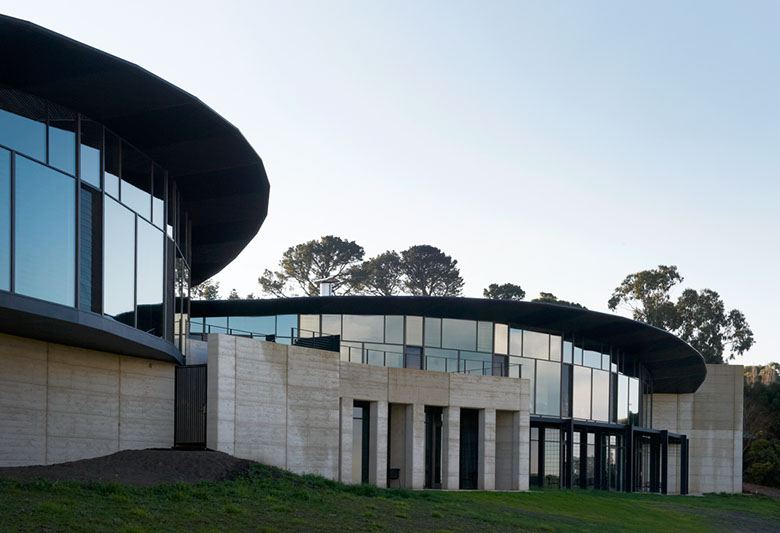 Definitely one to stick on your own Mornington Peninsula winery hit list. Want to meet the Mornington Peninsula makers and more? Then check out more of our adventures below!